All you Fetty Wap fans better beware! The musician is set to make his big screen acting debut in the upcoming Lionsgate thriller Blood Brothers, which is a crime drama on the verge of tilting into horror territory. Today, we have the first trailer and poster for this exciting November release. Strap in and check it out. When an ex-con takes murderous revenge against childhood friends whom he believes let him take the fall for a crime they committed together, one of the friends, now a cop, risks his life to stop him in this gritty thriller. 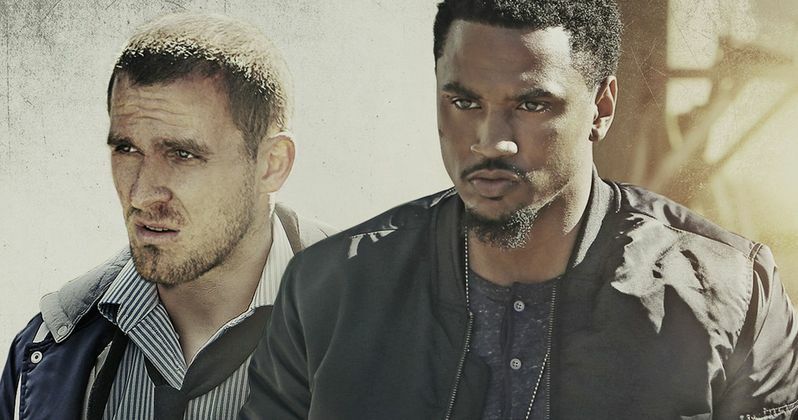 Fan-Favorite musical artist Trey Songz takes the lead as police detective Sonny. Songz has previously been seen in the moves Baggage Claim and Texas Chainsaw 3D. He is joined onscreen by Jack Kesy, who plays the revenge-fueled Jake Banning. Kesy earned his villain stripes in the hit sequel Deadpool 2. He's also been seen in the recent Death Wish remake and the FX horror drama The Strain. Offering a nice background of ensemble players are China Anne McClain (Grown Ups 2, Black Lightning), Hassan Johnson (The Wire, Brooklyn's Finest) and Tanee McCall (Burlesque). Perhaps most interesting about the movie is that it is introducing top-selling music artist Fetty Wap in his first feature role. And there will be a surprise cameo by WWE Superstar R-Truth. Though, since they are teasing his appearance in the press release for the movie, it can't be too much of a surprise. Perhaps we'll never see him coming. Blood Brothers is an R-rated thriller that promises to bring plenty of foul-mouthed language, and exceptionally strong violence. Throw in some drug use and some sexually explicit material, and it sounds like fans of cop revenge thrillers are going to have one hell of a night. Blood Brothers will be crashing into theaters starting November 30, 2018, just as the holiday season begins to really heat up. If you don't have time to make it to the local cinema, Lionsgate has you covered with a simultaneous On Demand release. Clocking in at just 85 minutes of pure intensity, this may bring the quick getaway you need as family and friends begin to assault your every waking hour with Thanksgiving and Christmas plans. John Pogue directed Blood Brothers from a script written by Michael Finch & Karl Gajdusek. The movie is Produced by Michel J. Luisi, p.g.a., with Executive Producers that include Quincy Newell, Richard Lowell and Kevin Liles. Co-Producers include Jamie Elliott and Ralph E. Portillo. Matthew Irving serves as the director of photography, with James Gelarden serving as the production designer. Kenneth Marsten edited all the teeth-clinching drama, with a soundtrack provided by Mark Kilian and music supervisor Ashley Neumeister. And you can thank Dana Marie Embree for all the hot costumes on display. Blood Brothers looks like the action thriller we need this fall. You can check out what goes down in the trailer thanks to Lionsgate. We're sure you'll want to add this to your end of the year movie watch list.